IN THE 18TH AND 19TH CENTURY, SIDESHOW CARNIVALS known as misemono were a popular form of entertainment for the sophisticated residents of Edo (present-day Tokyo). The sideshows featured a myriad of educational and entertaining attractions designed to evoke a sense of wonder and satisfy a deep curiosity for the mysteries of life. 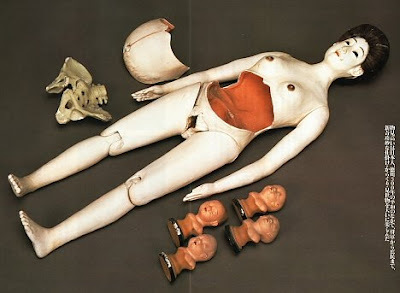 One popular attraction was the pregnant doll. For example, records from 1864 describe a popular show in Tokyo’s Asakusa entertainment district that educated audiences about the human body. 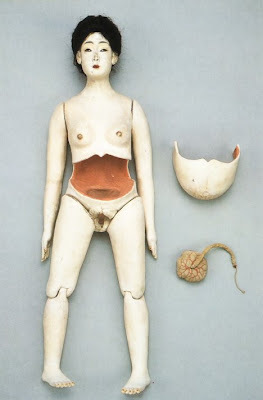 The show featured a pregnant doll whose abdomen could be opened to reveal fetal models depicting the various stages of prenatal development. 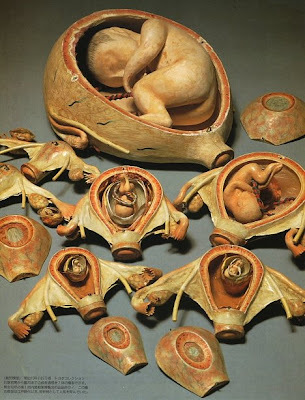 Similarly, records of Japan’s first national industrial exhibition in 1877 indicate a Yamagata prefecture hospital doctor named Motoyoshi Hasegawa showed off an elaborate set of fetus models illustrating seven different stages of growth, from embryo to birth. 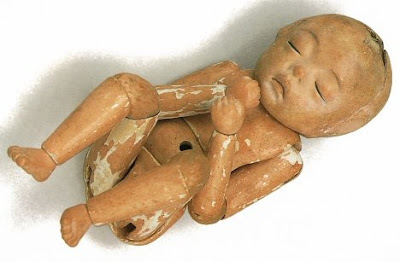 Although it is unclear whether the fetus model set pictured in the final image above is the same one Hasegawa showed in 1877, records suggest his model was a hit at the exhibition. [Source: Geijutsu Shincho magazine, July 2001] via PinkTentacle. An AM repost from 7/8/09. I've never seen Japanese dolls like these. They are beautiful. Thank you for posting this, John. 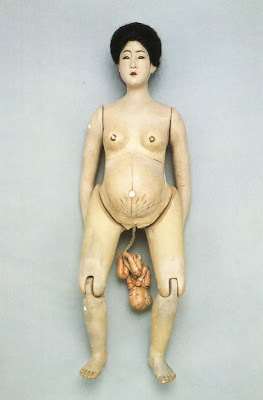 The science musuem in Florence www.imss.fi.it has some similar plaster of paris models for obstetrical training. Even the upsetting ones (for pregnancies gone wrong) are so beautiful I couldn't stop looking at them. If you're in Florence and tired of the Uffizi gallery, definitely check it out. Angela, so right about the science museum in Florence. And, Angela, I love 100 Fugitives. this is very disturbing, but its hard to not look away! Are these possibly available for purchase? I would really like to have one. These are almost impossible to find. I have been looking for years. They are spectacular. Thanks to share this post and its all information is really very nice of useful.